← Happy Birthday to my baby girl! Happy Labor Day! How are you enjoying your last day of summer vacation? Pool? Beach? BBQ? Or, are you one of those last-minute Moms who will be hitting the malls today, searching for school supplies and the perfect first-day-of-school outfit? No matter how you’re spending your day, meal planning and packing lunches/snacks will definitely be on your mind. Last week I posted a great crockpot recipe to help make things easier for you. Today, I’m featuring an item that’s perfect for a snack or quick breakfast. Mom, child or otherwise – this is a delicious treat! And yes, it’s another recipe that has helped me use up the massive quantity of pears from my tree. Preheat oven to 400 degrees. Line two muffin tins with liners (16 in total). Place pears in a food processor and pulse until just chopped. Set aside. In a large bowl, combine flour, sugar, brown sugar, baking powder and ginger. In another bowl, mix sour cream, oil, honey and eggs together. Add oil mixture to flour mixture, folding until just incorporated (do not overmix). 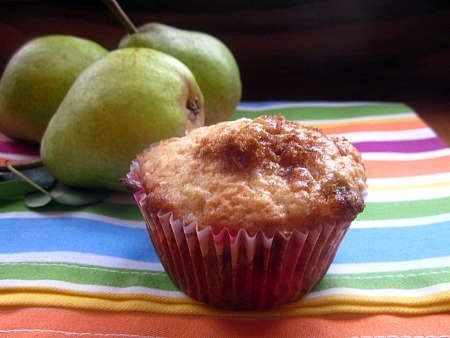 Add chopped pears, then divide evenly into muffin cups. Sprinkle each with a little brown sugar, then bake for about 20 minutes. Remove and cool. This entry was posted in bread, breakfast, dessert, freezer friendly, pears, QuickAndEasy, snacks. Bookmark the permalink.